So, you've got your new kitten home with you and you're very excited to start doing all of the fun things that attracted you to bengals in the first place: taking him on car rides, and out for walks on his leash! There are some important steps to follow prior to attempting these activities. You can "make" or "break" your kitten's fondness for his harness and for these activities, depending on how you undertake his introduction to them. ​Once he is comfortable, you will know the time is right to take the next step. ​Time to head out the door! ​Let him sniff and explore while you simply focus on keeping him untangled (!). We recommend a retractable leash to allow for some length of leash for free roaming during this first phase of leash training. 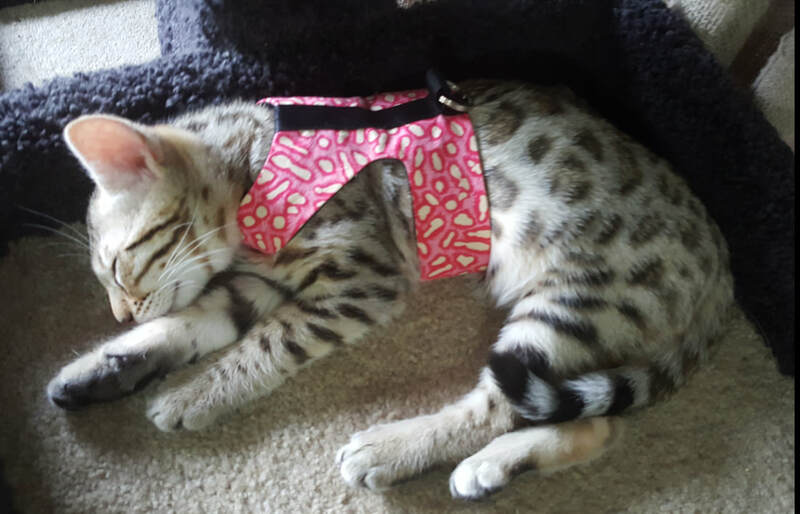 After a few exploratory trips out of doors, you can embark on attempting to train your kitten to walk along side of you, but this will be the topic of another post. For the moment the goal is to focus on getting your kitten outside for some exploration and perhaps ready to travel in the car to more exciting locations for walks.